Purchasing your own modem for Comcast Xfinity is a smart choice, but that does not mean that it is an easy choice. The first thing that you need to consider is whether the modem is included in the list of Comcast approved modems. You need a Xfinity approved modem or you will not be able to get the most out of your internet services. You also need to take into consideration what you need from a modem and the type of use that you need for your household. But how can you know what the best choice is? This is what you need to know. If you are renting a modem from Comcast, the time has come for that to stop. Rental fees will add up quickly, and buying a modem would save you money in the long run. Comcast Xfinity charges $8 a month for modem rentals, but if you have Xfinity voice as well, there is another $8 modem rental fee, meaning you could be looking at $16 a month or $192 a year. If you are paying for that, you can certainly buy your own Comcast Xfinity compatible modem. In addition, your own modem will give you better control of your security and the ability to choose a modem with the speeds that you need for your home. When it comes to buying a modem for Comcast Xfinity, you will get to choose between a modem and a modem router combo. A modem uses a coax cable to connect the cable outlet to the modem, then an Ethernet cable from the modem to your computer. A modem by itself will not give you wireless internet, you will need a router for that. Once you have purchased your Comcast Xfinity Modem combo, it is time to set it up. Step 1: Plug in the modem. This means to the power outlet as well as the cable port that is in your wall. You need a coax cable to plug it into the cable outlet. The Editor’s choice for the best Comcast Xfinity approved cable modem is the Motorola MG7550. This is a dual band modem with a built-in router to handle your WiFi. It also has Power Boost, which adds high-performance WiFi power amplifiers to boost the WiFi signal the best speed and range possible. Having the router within the modem will give you a more streamlined connection, reducing the potential for interruption while ensuring that it does not take up much space. The modem is also designed to not take up much room, with a vertical, antenna-free design. For a high performance Comcast Xfinity approved modem, you should go with the Netgear Nighthawk AC1900 DOCSIS 3.0.This is also a dual band modem, allowing you to choose from either the 2.4GHz or 5 GHz bands. Complete with four Gigabit Ethernet ports, this modem also 1.6GHz processor to boost performance, and is compatible with Spectrum internet as well as other providers. This is another combo modem, meaning the router is built into the modem, allowing you to take up as little space as possible while keeping a clear connection. If you need a budget-friendly modem for Comcast Xfinity, the best choice is the Motorola MG7315. This is a DOCSIS 3.0 modem, which is about 8 times faster than the DOCSIS 2.0. The MG7315 is also made so that it is essentially a plug and play modem, meaning it has an easy setup. The actual cable speed is up to 145 Mbps. This budget friendly modem has a built-in router with Power Boost, which means high performance power amplifiers to boost the wireless signals, giving you boosted speed and range. With its four 10/100/1000 Gigabit Ethernet LAN ports to wired connection, this is a good choice for streaming on HDTVs, game systems, and mobile devices. 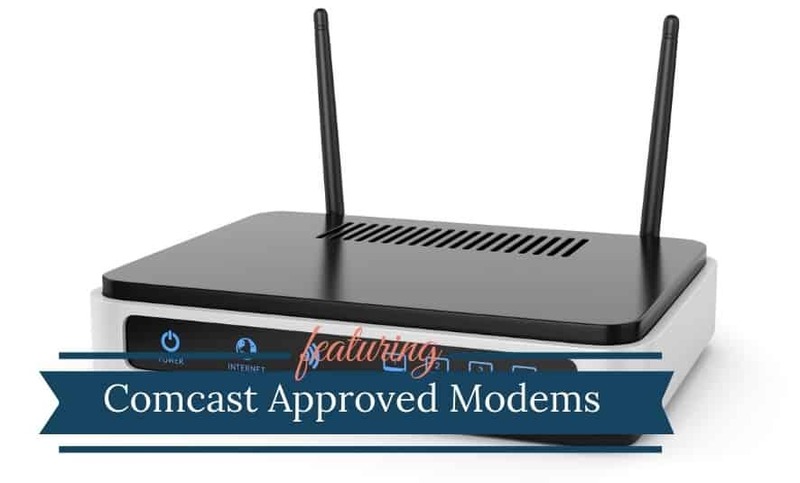 While this is an Xfinity approved modem, it will also work with other ISPs, including Spectrum, Cox, and others, meaning it could still work if you changed your cable service in the future.